As 2011 ends and we begin 2012; here at SportsRantz.com we like to recognize the Top 10 Moments in the 2011 NASCAR season voted on by the SportsRantz NASCAR Fan Council and our NASCAR staff writers. So lets take a walk down memory lane and relive some of the best moments in NASCAR’s 2011 season. 10. Two-Car Tandem Racing – The two car tandem racing debuted this season and well it caused quite the controversy between fans, owners and drivers. The tandem racing made enemies of a lot of drivers throughout the season but once you got paired up with the right pusher..well we know how it turned out. 9. Taking the Flag – Brad Keselowski endured a horrific, painful crash during a testing session at Road Atlanta. The driver tweeted photos of his broken ankle, then days later put on a brace and took on the always-challenging Pocono Raceway. Not only did he stay in his car for the entire race, he also went on to win the event in a remarkable and enchanting performance. 8. Running Dry in Charlotte – Dale Earnhardt Jr. worked diligently to win a NASCAR Sprint Cup race this season. He came awfully close in the Coca-Cola 600 at Charlotte Motor Speedway. He led the race, taking the white flag, but ran out of fuel on the backstretch. He was riding through the final turns when Kevin Harvick slipped by to get the win, breaking the hearts of Earnhardt Jr.’s legion of loyal fans. 7. 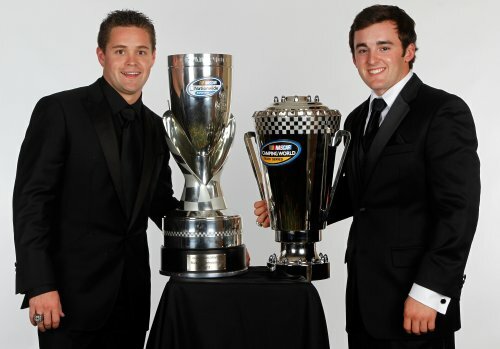 From Rookies to Champions – Austin Dillon and Ricky Stenhouse Jr. brought a new era of young, driven drivers to the NASCAR ranks. Their titles share the No. 7 moment of the year.Dillon stirred the NASCAR Camping World Truck Series, driving the No. 3 to two victories and the title as well as earning the series most popular driver honor Stenhouse tore through the Nationwide ranks. Driving his Roush Fenway Racing car to a significant lead in the title race, he won two races and amassed a stellar 26 top-10 finishes in 34 races. 6. Critical Change in Points – NASCAR officials changed more than even they might have envisioned on Jan. 26, 2011. That’s when the sanctioning body announced the new points structure that separated positions by a mere point and made 48 points the maximum a team could earn in a race. That laid the foundation for the most thrilling Chase to date, for Carl Edwards to enter the season finale with a three-point lead, for Tony Stewart to win the race and force the tiebreaker and for the win total, which NASCAR had set out to emphasize, to determine the 2011 champ. 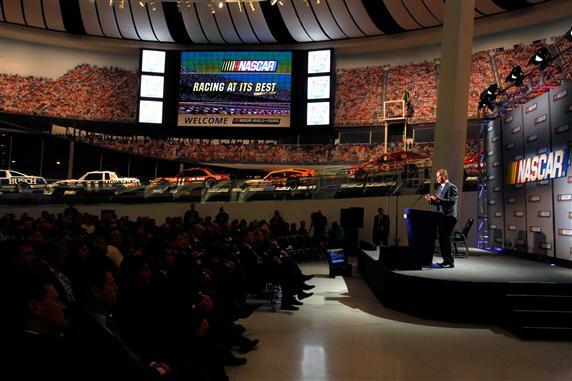 Turns out that day back in January was quite a moment for NASCAR CEO Brian France. 5. Bash Brothers, oh wait.. the Busch Brothers Troubles – Kyle Busch didn’t enjoy a season filled with all positive highlights. The Joe Gibbs Racing driver intentionally wrecked Ron Hornaday Jr. in a NASCAR Camping World Truck Series race at Texas Motor Speedway, ending Hornaday’s shot at the title and landing himself a severe penalty. Busch was parked for the weekend, spending the Sprint Cup race on the pit box watching Michael McDowell drive his car, then sponsor M&Ms pulled off the car for the final two races of the year. Kyle wasn’t alone in drawing penalties from NASCAR, though. Older brother Kurt Busch chastised his team on radio and had a pair of confrontations with media members. The final came in the season finale, after which he was fined $50,000 for an inappropriate gesture and what the sanctioning body deemed disrespect toward a media member after a fan video of his tirade hit YouTube. He parted ways with Penske Racing in early December. 4. Mr. Rowdy Busch Lands 100 – Kyle Busch marked his NASCAR season the same way he has for years – with lots of trips to Victory Lane. Busch moved among the all-time greats, becoming just the third NASCAR driver to snare 100 wins in the top three series. With his win in the Nationwide Series race at New Hampshire Motor Speedway, Busch hit the mark. He also tied the all-time Nationwide wins record of 49. At the time, he also had 22 wins in Sprint Cup and 29 in the Truck series. 3. Stands Alone at 85 – Jeff Gordon etched his name into another piece of NASCAR history and further bolstered his status as one of the all-time greats this season. Gordon stormed to victory at Atlanta Motor Speedway, not only improving his standing for the year, but also taking his 85th career NASCAR Cup win. That broke him free of a tie with Darrell Waltrip and Bobby Allison on NASCAR’s all-time wins list and gave him sole possession of third. He now ranks behind only Richard Petty (200 wins) and David Pearson (105 wins) on that list. 2. Trevor Bayne Wins Daytona 500 – A day after turning 20, a little-known driver took a legendary team to a new level of glory. Bayne made his debut in Sprint Cup racing at Daytona International Speedway in the season-opening Daytona 500. Driving a limited schedule for the long-running Wood Brothers Racing team, he not only made the race, but pulled off the stunning upset. He charmed a NASCAR nation and opened the season in stellar form for the No. 2 moment of the season. Bayne’s win marked the first of many first-time winners in the 2011 season. 1. 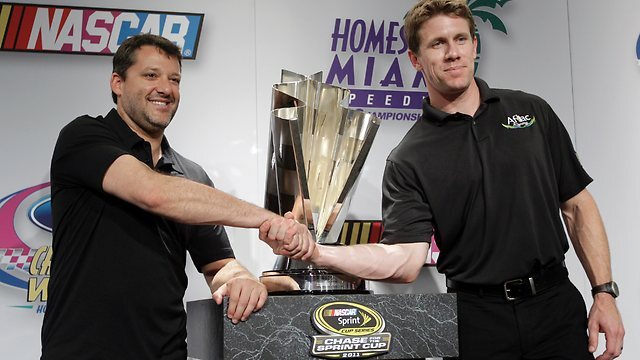 The Epic Down to the Wire Battle – Tony Stewart and Carl Edwards embodied everything that a championship should be. They battled to the wire – including in the season finale, where aggressive driving and daring strategy netted Stewart the race win and the title in a tiebreaker scenario. Edwards was calm and collected throughout the Chase, steadily reeling off top finishes and posting a worst finish of 11th. Stewart was all-out, winning five of the 10 Chase races, including that riveting season finale. The moment of the year was unquestionably the closing segment of that Homestead race. With Stewart gambling on fuel strategy and making three-wide passes at will with Edwards chasing him down. It was an epic, riveting moment in NASCAR – and one that fans will remember for years to come.